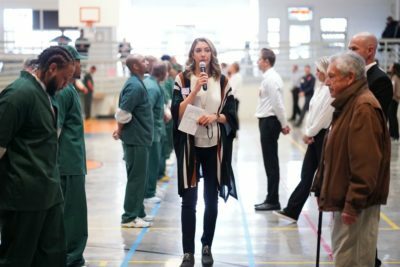 Last week, I had the opportunity to volunteer for the second time with Defy Ventures – an incredible organization with a grand vision of ending mass incarceration and cycles of recidivism. Defy pairs business executives with incarcerated persons who take on new identities as “entrepreneurs-in-training” (EITs). The goal is to defy the odds and help the EITs become successful business owners, employers, parents, and community leaders. 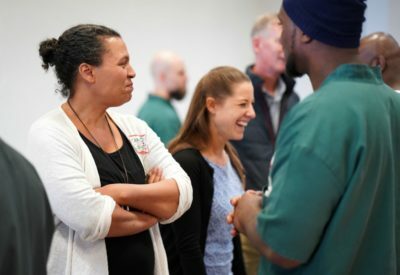 While 60% of those released from prison will find themselves back behind bars within three years, fewer than 5% of Defy graduates do – a huge testament to the transformational power of this program. This summer was my first Defy experience, when I was fortunate to join with other executives to judge a business pitch competition to wrap up the very first Colorado cohort of Defy. EITs pitched us their ideas, Shark-Tank-style, and we provided feedback and voted for the best ideas to move to the next round. The finalists in our competition then had a very special celebrity judge, Colorado Governor John Hickenlooper, who carefully listened to their impassioned pitches and selected a winner. 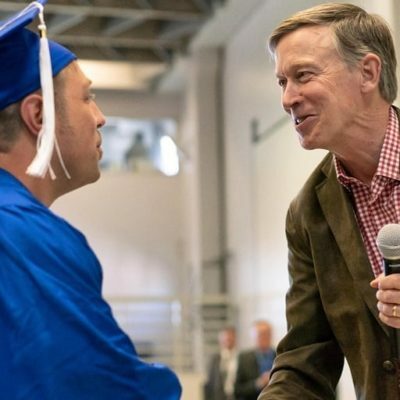 And while the winner received a very real (and substantial) check to start his business, he immediately gave the money back to Defy Colorado to help fund another class of EITs – the cohort that started this week. The day culminated in a graduation ceremony; for many of the EITs, it was their first time ever wearing a cap and gown. Each of the graduates earned not just a Defy diploma, but an actual business certification from Baylor University, which will help them secure employment after release. These men worked hard for that certificate, transforming their lives in the process, and it was an honor to be part of this inaugural class. Governor Hickenlooper shaking the hand of one of my favorite EITs. You’re going to be hearing much more from me about Defy and my experiences in prison, as I’ve recently started helping with Defy’s social media strategy and content. But today, on Thanksgiving, I want to share with you some reflections on the powerful “step to the line” exercise that’s used to kick off a new cohort of EITs and volunteers, and start the hard work of brutal honesty that is often especially at odds with machismo prison culture. “My parents regularly tucked me into bed at night, and told me they loved me.” “I had more than a dozen books in my household growing up.” For these questions, the chasm between the EITs and the volunteers was wide. Despite our distance, I continued to stare into the eyes of my EIT partner, and hoped my eyes could convey my sorrow and empathy that my childhood had what his had not. “One of my parents was incarcerated.” My EIT buddy moved up, along with almost all of his peers. Did you know that 70% of children born to a parent who was incarcerated will also end up in prison? Later, in a one-on-one discussion, my EIT partner told me that while he did not expect to ever leave the prison, he hoped that by working hard to complete this program he could set an example for his teenage son and help him beat the odds. “I’ve done something for which I could be arrested.” All of the EITs moved to the line, along with some of the volunteers. “That includes drinking and driving.” Many more volunteers moved forward. “That means even one drink.” All of us were on the line. “I’ve been arrested for a crime.” Almost all of the volunteers stepped back, and a wave of emotion and privilege washed over my brain. We had all committed crimes, but only half of us had paid the price for doing so. “At the age of 18, with my lifestyle, I didn’t think I’d live to see 21.” Almost bashfully, many of the EITs moved forward, and my heart went out to them. “I have struggled with depression.” With tears in my own eyes from this and many questions before, I joined my partner on the line, and we shook hands – the only physical contact allowed between volunteers and EITs. Although great big bear hugs are a regular part of the Defy program, they can only be volunteer to volunteer or EIT to EIT. Throughout this exercise, there were so many times I wanted to hug my partner. While the volunteers could come behind the physical walls that separate the EITs from the outside world, this was another reminder that we were still weren’t allowed the simple human-to-human gesture of a hug to provide empathy and support. We ended with some uplifting statements, including “I already love Defy.” I was wholeheartedly on the line for that one, and waving my hands in the air enthusiastically! I never thought I would say this, but after just two sessions with Defy, I fully stand by one of its mantras: I don’t believe in criminals; I believe in people who have committed crimes. And most of all, I believe in people. When I first started running, it was to prove to myself that I could grow and change. My marathon journey was life changing – showing me that with hard work and persistence, I could challenge who I was and become someone new and completely different from who I was before. That lesson has stuck with me through numerous endeavors – from musical theater nerd to prize-winning runner, from Manhattan city girl to Colorado mountain woman, and from scared scholarship student to successful businesswoman to elected politician. But before I started with Defy, I honestly didn’t realize just how much capacity human beings have for change. If I’m being totally honest, that first time I went into prison, I went in with a lot of reservations. Should I really be spending my time helping the “type of people” who had done terrible things? The “type of person” who would deal drugs, steal cars, and even kill people – that obviously wasn’t me, or anyone I knew. Surely these were inherently “bad” people, who would always be “bad” at heart, and I should stay as far away from them as possible. Through Defy, though, I’ve come to see the EITs for who they really are – people who have messed up, sometimes pretty badly, but who still have the capacity to grow and change. 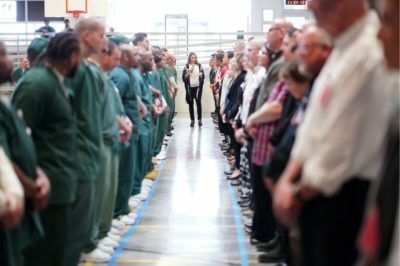 In my first visit to prison, I met a guy who was about my age, and who has been in prison since he was 17 years old. I think about how much I’ve changed since I was 17, and I think about what a long time ago that was… is it possible that he too has changed in that time? Thanks to Defy, I am starting to think so. This smile is totally genuine. This Thanksgiving, I have so much to be thankful for – and I think I’m more filled with gratitude than I’ve ever before been for the holiday. While I’ve worked very hard for what I have, I also realize I’ve been so lucky with both the hand I was dealt and how my hard work has been rewarded. And, I’m so lucky for the many opportunities that have come my way – like the opportunity to work with Defy. I can’t wait to go back to prison next month, and learn even more from these men. 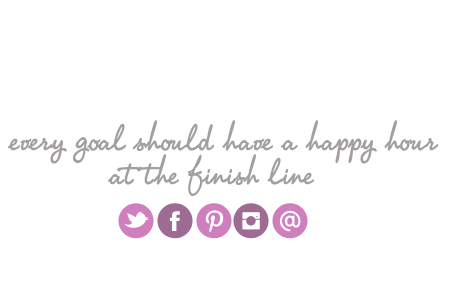 If you’re interested in learning more about Defy and getting involved, visit defyventures.org. Every experience you have gone after has challenged you in different ways but the growth has been exponential as I witness your changing attitude forged on newfound insights and interactions. This Thanksgiving tale brings tears to my eyes, and yet I know your involvement in Defy has already brought a positive effect to the lives of others and within yourself for which you can take immeasurable pride, Laura! You have learned how to step up in a very big way…much love as you carry on!